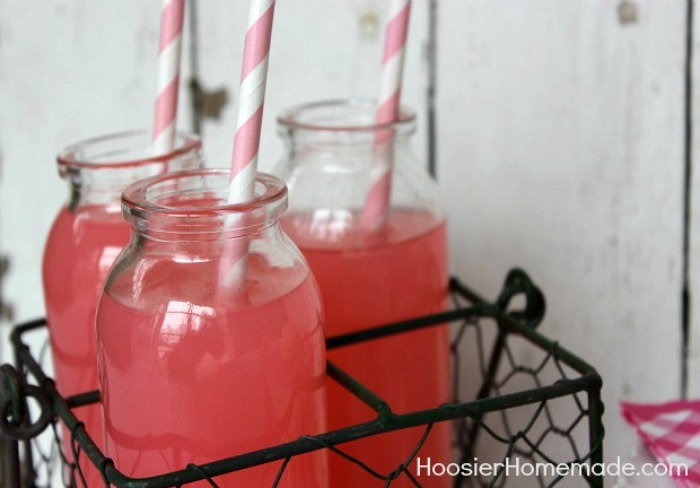 There’s nothing like sitting on the front porch, sipping a tall glass of Pink Lemonade! 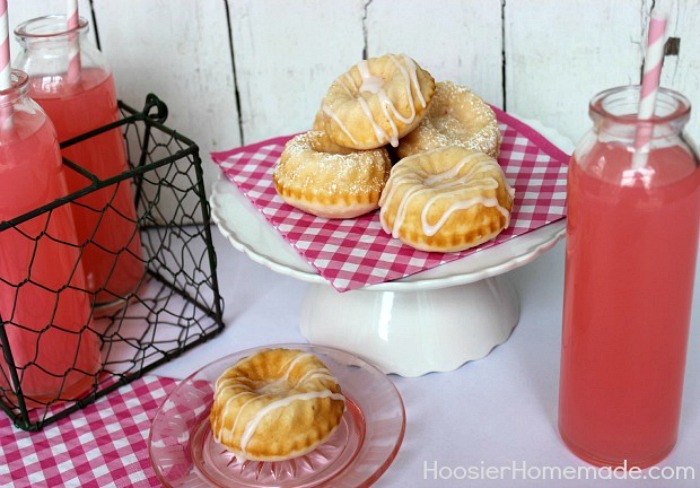 While we are anxiously awaiting warmer weather around here so we can enjoy sitting outside, I am enjoying this Pink Lemonade Pound Cake. Starting with a white cake mix and adding a burst of flavor with Pink Lemonade concentrate and drink mix, this Pound Cake is super easy to make. Typically pound cake is baked in either a loaf or bundt pan, but I thought it would be fun to bake them in a mini version. Who doesn’t love little individual servings of cake? 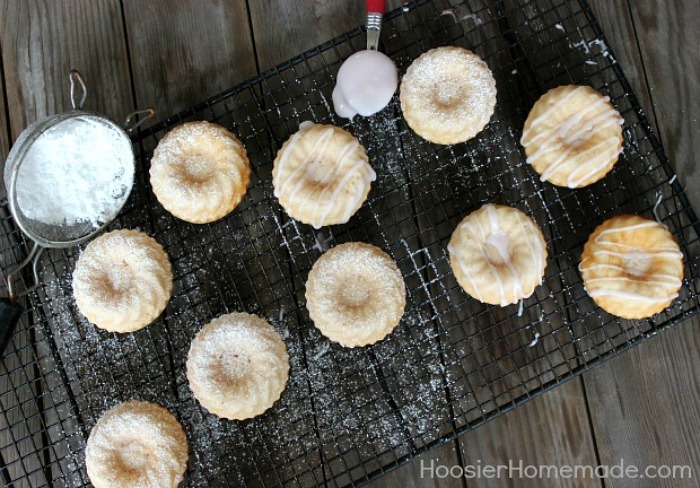 I used a Fluted Muffin Tin for the individual servings, making them perfect for just about any holiday, perhaps for a Mother’s Day dessert this weekend. This Pound Cake has a little tangy flavor, but not too much and is creamy from the addition of sour cream and cream cheese. 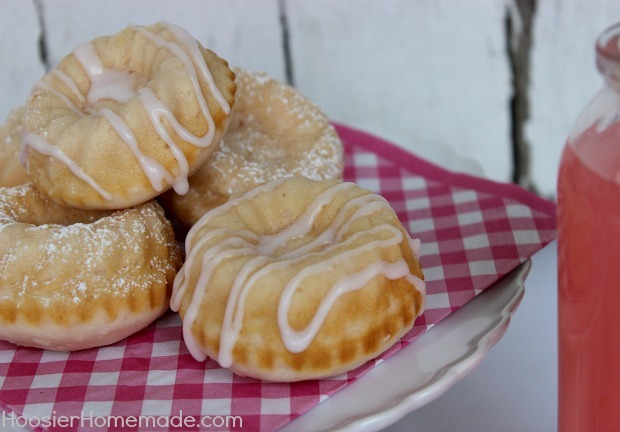 You can either give them a dusting of powdered sugar or for a little sweeter version, drizzle some with Pink Lemonade Glaze. And I just had to serve them with a cute tall glass filled with Pink Lemonade and a pink stripe straw. Smooth and creamy pound cake with a little tang. Bake times will vary depending on the size of your pan. You had me at lemonade! These look absolutely lovely! Just found this today and must must make. Woops, I don’t have the lemonade mix until I go shopping. Any suggestions for a substitute? Hi Lexy, sorry, there really isn’t a substitution for the lemonade mix, the cake gets its flavor from it. After 1 1/2 hours in oven (bundt) batter is still liquidy.Edges are burnt…I spent a lot of money,time,energy etc and am not happy!! What went wrong? Hi Barbara, I’m sorry you had trouble with the recipe. We did not make it in a regular size bundt pan, we only made the small size bundts. Was the pan too full? Or maybe the oven didn’t heat correctly? I apologize I’m not sure what could have happened. These looks so yummy and are so cute! I am a big fan of anything pink lemonade! 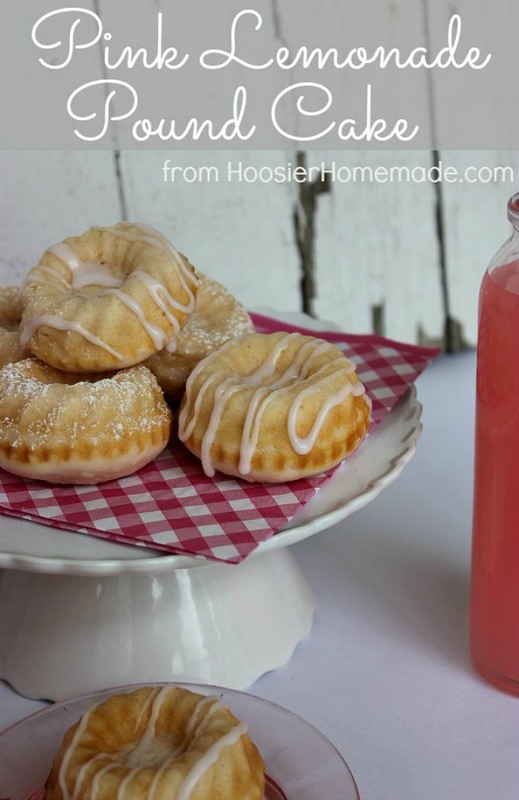 Your pink lemonade pound cake sounds delicious. I have one question though. Thank you for sharing all of your delicious recipes!!!! Hi Janet, any kind of pink lemonade drink mix, the one I used was Country Time. loooove pound cake! and the pink lemonade flavor sounds awesome! my mouth just puckered at the thought of these, but yummy 😉 This sounds tart and delicious and PERFECT for the summer picnic table! Thanks soo much for sharing! That looks fabulous! Look at the display as well! Beautiful! Oh, I love lemon cake. Sounds yummy!